Enormous Pop! Vinyl Figure at 23cm tall! Pop! Vinyl Figure of Disney's Main Man (or Mouse). Mickey Mouse looks great as a 2012 SDCC Exclusive! Disney's main man (or mouse) as an extra-large Disney Pop! Vinyl Figure! This amazing Mickey Mouse 23cm SDCC 2012 Exclusive Disney Pop! Vinyl Figure features Disney's main mascot in wonderful Pop! Vinyl form, but at a whopping 23cm tall. 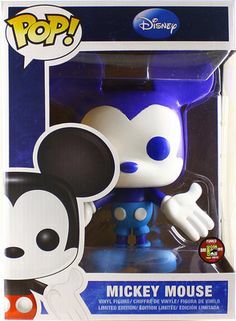 A San Diego Comic Con 2012 Exclusive featuring special blue colouring, this is one figure that fans of Disney, Mickey Mouse, and the Pop! Vinyl series can't afford to miss out on!